In Zendo, players are provided sets of small plastic pyramids, blocks, and wedges that come in red, blue, and yellow. One player is the moderator for the game. He or she chooses a rule card from the deck supplied and then builds two little structures with some of the blocks. One structure follows the rule, while a second structure does not follow the rule. Examples of “the rule” might be: the structure must contain one block of a specific color, the structure needs to use only two pieces, or something more complicated like one blue piece must be touching a red piece. Players then take turns building structures and the moderator indicates whether they satisfy “the rule.” Alternatively, a player can build something and call for a Quiz. If so, all players vote on whether the new structure satisfies the rule. If a player guesses correctly (guess if it satisfies the rule or not), they earn a guessing token. If a player has at least one guessing token, they can give up their turn to guess the rule instead. The active player turns in one of their tokens and states their version of the rule. The moderator then must build a structure that disproves the guessed rule. They can build something that fits “the rule” but not the active player’s guess or something that matches the active player’s guess but does not satisfy “the rule.” If the moderator is unable to disprove the guessed rule, the active player wins. If the guess is disproved, the active player can guess again, until they run out of guess tokens at which time the turn moves to the next player. The previous version of the game was played with pyramids of three sizes and players were often encouraged to create their own “rules.” It also had a thinly layered theme of eastern philosophy. While I miss my Zendo set with extra colors and pieces, and I liked the theme, the new version is far more approachable. Having entirely different shapes helps to quickly identify a structure, and the theme always did make the game seem more complex than it actually is. The previous edition had a deck of cards with suggestions for “the rule”, but the new edition has players to only use the enclosed cards. 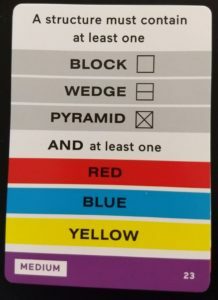 Cards contain a main rule with one or more modifiers (ex.“only one” and then spots for each color) players use provided clips to mark their rule card to remind them what modifiers they chose. (For the former rule, I would mark “red” on my card to remind me that it is “only one RED piece.”) Cards come in several difficulties. There are easy ones like “must contain exactly one blue piece” all the way up to difficult ones like “must contain more blue pieces than blocks.” I found in the previous version that rules tend to be harder to guess than one might think, so providing a good set of cards with labeled difficulties is a great way to play new or new-ish players. The current version also contains two different rulebooks. The game rules are explained in the first book, while the second book goes a bit deeper by giving advice to players, helping define the possible attributes to use in making rules, and two player options. As I mentioned, I use Zendo in my classes to show students how inductive reasoning works and provide it in the context of the scientific method. It is a great way to show them how information can be gained even if one performs an experiment with a negative outcome. I’m glad to see the game back in print and this version is definitely more approachable for beginners. There’s nothing to prevent players from going off the tracks and making their own rules, but I agree with the designer that this should only be done in groups composed entirely of experienced players. 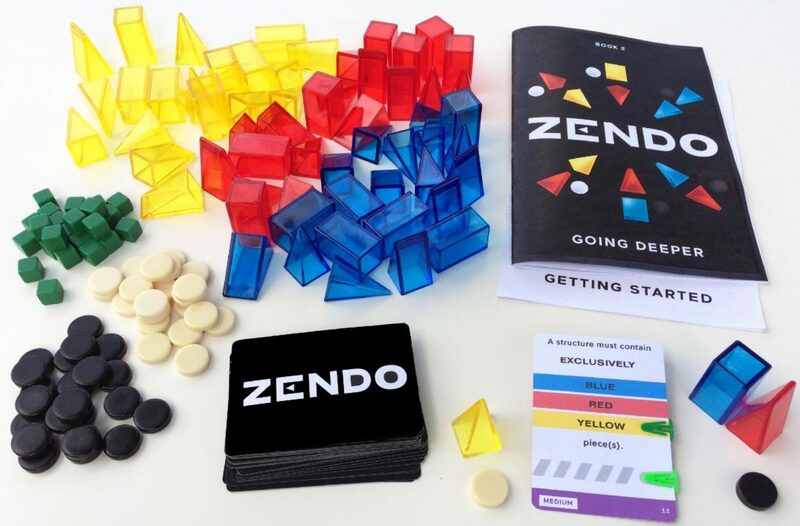 Whether played competitively or simply for fun, Zendo is a great logic puzzle game. Some players may be better at guessing rules than others, but everyone can still have fun trying to predict which way a quiz structure may go. I’m typically lukewarm on abstract games, but I do enjoy Zendo played in a friendly, laid back manner. There is no writing or reading to be found, and there isn’t even that much deep strategy. Thus, the game scales very well for young and old players. One simply has to be careful to play with very simple rules when playing with younger players. As a game that teaches inductive reasoning, Zendo makes a great game to play together as a family. The provided rule cards help to make sure even younger players can moderate and not come up with rules that are too difficult to solve. As a fellow teacher, can students complete this game in a 45 minute period? How many games do you need for a class of 25-28 kids? Can kids pair up? Is there a discount for teachers buying multiple copies of the game? We do everything with some discussion in a 50 min period. I don’t play the “game”, where they do the formal guessing, etc.. .competitively, they just try to figure it out in their groups. You could probably get away with something like two sets spread over three groups, maybe one set per two groups if you keep things simple. I give them some examples, then have them try to figure out the rule “must have at least one red” or something. Then I do “cannot have a yellow touching the ground” After those two I stop and talk about the scientific method (induction and deduction) and how a “negative” result is just as useful as a positive one. We typically have time for one more game that I let a single student run.